With over 150,000 copies in circulation, the Sourcebook is the essential guide for improving reading achievement by helping educators to bridge the gap between evidence-based reading research and actionable instructional strategies. Diminish is a word finding puzzle that can be used in a classroom or adult rehab setting. Use our blend cubes together with CVC or alphabet sets to create thousands of sounds and words. 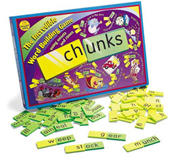 A fun game for grades 1 to 3, Chunks consists of 140 durable plastic tiles showing the most frequent onsets (beginnings of one syllable words) and rimes (endings of one syllable words) for practice and fun in word building. An instructive and enjoyable way to shatter the tedium of English grammar lessons! Successfully develops phoneme awareness the ability to identify individual sounds and their order within words for competence in reading, spelling, and speech. Assessing Reading: Multiple Measures, Revised 2nd Edition provides a collection of tests for the comprehensive assessment of skills related to reading. Strong focus on skills and strategies needed for writing building vocabulary, sentences and paragraphs; learning about sequencing; awareness of structure and more. Designed to tune a student into the creative writing process, reproducible pages range from simple sentence completion exercises, to paragraph and story starters, story skeletons, whole paragraph prompts, and much more!